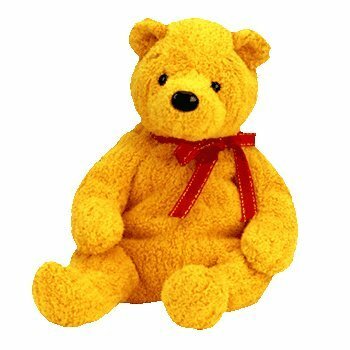 Poopsie is a yellow bear made from a soft yellow material. He has black button eyes and a larger black button nose. He wears a red ribbon tied around his neck. ‘Cause by your side is where I’ll stay! Poopsie was released on 31st July 2001. His Birthday is on 31st March 2001. Poopsie was incredibly controversial when he was released. Not only was his design a complete knock-off of Winnie the Pooh, but the name was even remarkably similar. He was retired on 8th April 2002.